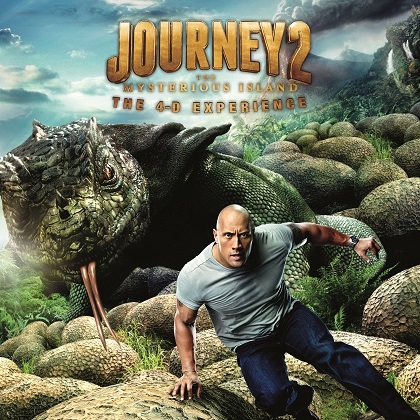 Sequel to the hit movie "Journey to the Centre of the Earth"
Tickets must be redeemed at the 4D Adventureland, please have your iVenture Card present. Collection Information Tickets must be redeemed at the 4D Adventureland entrance, please have your iVenture Card present. Drop by the home of unlimited fun! Sentosa 4D Adventure Land brings you Journey 2: The Mysterious Island. An immersive 4D movie experience where you become a part of the adventure through a synchronization of 3D imaging and special effects such as wind scent and water sprays! Watch the elephants and butterflies glide past you and feel the splash of the stream as you try to cross it with your favourite stars. Fly through tornadoes, encounter giant lizards, discover the lost city of Atlantis and pilot Captain Nemo’s submarine! This is a one-of-kind adventure you won’t want to miss it. There is a height requirement of 90cm. Any child who does not meet the height requirements needs to be seated on their parents’ lap. Please ensure you have your iVenture Card present with you on the day.